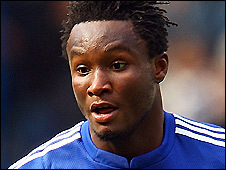 Chelsea midfielder John Mikel Obi has signed a new five-year contract with the Stamford Bridge club. The 22-year-old, whose deal runs until 2014, joined Chelsea from Lyn Oslo in 2006 and has become a a first-team regular in the holding midfield role. "It was easy to commit to as I am happy here and when the opportunity came it was good to sign after speaking to the club," Mikel told the club's website. "My future with the new manager (Carlo Ancelotti) will be bright." Nigerian international Mikel started in Chelsea's pre-season victory against Inter Milan on Tuesday and says he has a "good working relationship already" with Ancelotti. How highly do you rate Mikel? Mikel has played under managers Jose Mourinho, Avram Grant, Luiz Felipe Scolari and Guus Hiddink in his time at Chelsea. "All the managers I have played for here have their own type of systems they want us to play and whoever comes in will want to change little bits and pieces," he added. "There is not much to change but they all bring in different views and the new manager wants us to play in a certain formation, which we need to get used to before the season starts."